The first 50 issues are now available to purchase as PDFs on one CD. Lance and Longbow Society members can order their copies using the link below and will be required to enter their membership number in order to get the special members only price of £9.00 + postage. Non-members can buy a copy of the CD for £12.00 + postage at Vexillia Ltd. 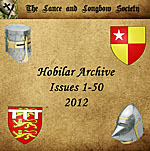 The Lance and Longbow Society also have a number of related publications available to purchase. Items can be ordered via this page using your credit card and PayPal. All payments are secure. Postage and packing is based on the value of the order, however, there is also a fixed shipping supplement based on delivery loaction. Please select one of the following shipping options. Failure to select the correct shipping option may result in a delay to your order being dispatched. If you haven't already done so please select one of the following shipping options. Failure to select the correct shipping option may result in a delay to your order being dispatched.